My name is Jashmin, I am 25 years old and I have been involved with Talent Match right from the beginning as a member of the Young People Investment Team. It is really exciting that today our ideas for how Lottery money should be spent have become reality. It all started almost two years ago, when I was one of 20 young people recruited to decide the priority areas for an investment targeting young people. 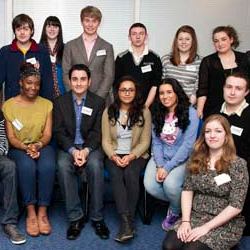 This wasn’t just the views of 20 young people – we spent two months consulting young people from all over the country. We used our networks of schools, friends and social media to reach thousands of young people and one issue kept coming up – youth unemployment. There was also a strong sense of young people feeling devalued by society, especially after the riots, and they felt a lack of aspiration due partly to the negative portrayal of young people in the media. We are constantly being perceived as: lazy, materialistic, criminals, amoral, uneducated, welfare dependent, and the list goes on. There was a strong desire to improve these perceptions and to show society that young people do want to work and do want to make a positive contribution. It was these views that fuelled Talent Match. We wanted a positive programme with young people at the centre from beginning to end – not just through our 20 central young people but in every area the programme reached. We wanted to offer young people a chance to learn new skills and boost confidence by being part of the design, development and delivery of a youth employment programme, which was shaped by their own views and experience of what was happening in their local areas. We knew that with the right support so many young people struggling with long-term unemployment could improve their lives and overcome the barriers to gaining a rewarding career. I have been involved in Talent Match since its launch and have seen the project proposals develop and been part of a committee making decisions over millions of pounds. That is why I am so proud that, after two years, 21 partnerships across England are starting work today to change the lives of unemployed young people.